OK. You tell me. What’s the link? Food, Furniture …… First Chemo Sesh! How do you write about a day of so many ‘highs’ when you were expecting lots of ‘lows’. Yesterday afternoon was “The First Chemotherapy Session”, the words of which used to fill me with worry just typing them down. But, because of Castle Hill Hospital’s Centre of Excellence title, and their patient care and understanding, and the brilliant, funny nurses, I was more than ready for it. So what did my morning entail? A lay in bed, even breakfast in bed, a gentle morning, being cosseted by Erik, comforting hot drinks to build me up? No. None of these things, by choice. (My choice). Up early as usual, on the computer and being so touched by wonderful messages for me on Facebook, instigated by son Paddy and his lovely Nicola, but added to by so many people out of my past, friends of my boys, friends from the Theatre, from all over the world, sending me lovely encouraging words so comforting that it just filled me with such positivity I felt I was glowing. So that was a great start. Now …… the reason I woke up Erik early was that we had given our L-shaped big settee to Paddy, Nicola and the children the week before, had been living on our little brown leather settee and this morning our new settees were arriving, before 11.00am. So we had to clear the lounge almost totally of tables, lamps etc to bring in the brand new furniture. Would you believe that we lived with this room until September 2013! Bare! I think Fizzi, our dog, was probably packing her doggy rucksack mentally, thinking ‘Oh now, not again. We only moved last year, and I like it here. What with my walks to the beach, and my own huge garden. Not even left me a sette to creep on to as they go out and shut the front door. Not good enough! Don’t want to go. Won’t go!’ That type of doggie thing. And bless them, the delivery men arrived at 10.30ish with our brilliant new furniture – a big 3/4 seater settee and a smaller 2 seater sofa bed, so that we can invite more guests. I don’t know about you, but when new furniture arrives, there is always that split-second panic – however much you know you’ve double checked the colour swatch against your paint etc, there is always a chance it won’t quite be a good match. But …… thank goodness, it was! In fact, it was, in our eyes, perfect! Hope you agree. Now, before you designer types reprimand us for mixing bits and pieces, this isn’t our finished look. Some of you know we hope to have our Garden Room extension soon, but because of my chemotherapy starting, we have put it on hold for a few months, and such as the clear Boughie Lamps and my lovely huge acrylic mirror on the wall are earmarked for the new room. The coffee table needs to be smaller, and the little cream chest of drawers is either for my new kitchen or for the new room. And the sofa bed may go in our downstairs front room, which doubles up as a library, and the little brown sofa may come back in the lounge! Are you following this, or totally bemused by my ravings? So if you imagine this room, with a light rough oak mirror in place of the acrylic one, with pictures either side, and maybe a smaller coffee table, that should finish it off. Then curtains, or blinds. 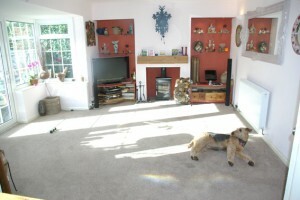 It’s a lovely, sunny room, but cosy warm in winter with the log burner doing it’s stuff. And it’s in here that I will collapse if I get the dreaded sick days – imagine me, draped in a rug (a bit like La Dame au Camellias but not quite so thin), watching the dratted pigeons, and lovely blackbirds, bluetits, long-tailed sparrows and robins competing for food. Well, that’s the furniture bit for now. Knowing me, it will probably be rearranged a bit before I’m satisfied. Figuring that I might be in need of comfort food over the next few weeks, and especially today and the next few days after starting my Chemo Sessions, I had chosen this morning, of all mornings, to cook gallons of my very favourite “Roasted Tomato & Garlic Soup”, to tide me through times when my appetite won’t be up to much. It’s a different soup – the tomatoes are halved, sprinkled with oil and sprinkled with a little sugar to caramelise the edges,and roasted in the oven to begin with, the garlic cloves also roasted with their skins on in a separate dish for a much shorter time. Meanwhile carrots, celery and onions are gently fried, then roasted tomatoes and garlic are added to the vegetables, with good chicken stock etc and simmered then liquidised. The taste is unbelievably rich, not strongly flavoured with garlic, but subtle. Luckily there was enough room in the chest freezer for all the cooled cartons, and, as all good cooks are taught to do by Masterchefs, Erik and I tasted quite a few spoonfuls to make sure it was good enough, and it sure was. By the way, the picture of tomatoes at the very top of this post was the result of our lovely kitchen garden we had to leave behind. But I am working on our new Kitchen Garden here, and it will be bigger than the last one, with tomatoes featuring strongly this summer, and planting my Raspberry Canes this weekend (see below). 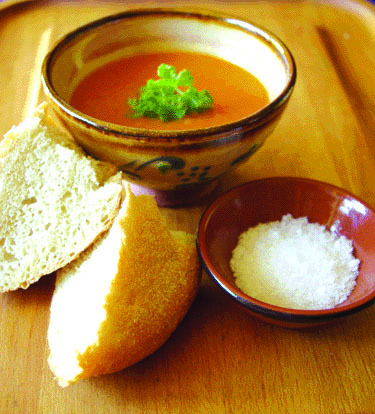 Click here for the “Roasted Tomato & Garlic Soup” recipe. The other comfort food made, or rather, baked, the same morning, was for this afternoon, and over the weekend. I knew I would be in need of something sweet, nutty and fruity to eat when I returned from the hospital, so I baked the special “Raspberry Bakewell Cake”, featured recently and apparently enjoyed by a few of my readers, including sister, Gina. It is very easy to bake, but takes about 50 minutes in the oven, and because I had been so busy in the morning, the cake was only just cooked before we left for the hospital, so I opened the oven door for a few minutes to bring the temperature down, then turned the oven off with the cake inside (not the best thing to do, but it worked.) It was perfect when we came home, thank goodness! 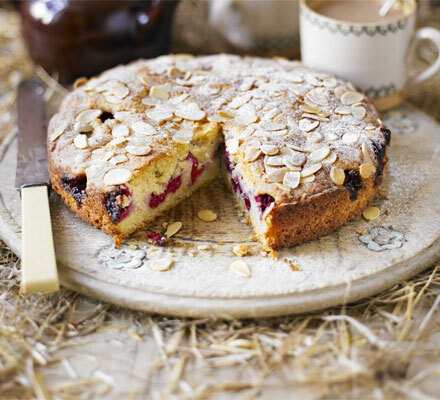 Click Here for the Raspberry Bakewell Cake Recipe. My intention, to bake this cake, was to come home from hospital, light the log burner and eat a big slice of this with a cup of tea. But the first Chemo session went so well, with a bubbly but brilliant young nurse, who made everything so painless and easy and took away any fear that was stirring deep down in me. We laughed and talked for an hour as I watched frolicking bunny rabbits in the hospital grounds enjoying the early spring sunshine. Laden with anti-sickness drugs, and the knowledge of how to use them properly by an extremely funny and knowledgeable pharmacist, I walked out of that big wide hospital room with a smile on my face, and tried not to get lost in the maze of corridors of that brilliant Castle Hospital to find Erik patiently waiting for me. We had a great drive back home, in that lovely, late afternoon sunshine that leaves East Yorkshire sparkling with an almost ethereal quality. Erik kept enquiring if I felt OK, meaning ‘Do you feel sick,’, and I just smiled and shook my head. Those tablets really work, for now anyway! Turning the corner, Hornsea Mere sparkled in the sunlight, swans gently sailing around the waters like miniature fluffy galleons. More smiles from me. Big smiles. Nearly home. So – log burner, cup of tea and slice of Raspberry Bakewell Cake – Well – No, not quite! Erik had treated me a bottle of my favourite Prosecco (not so much alcohol), so my treat turned out to be …… a new very comfortable settee to collapse on, a glowing fire, a glass of Prosecco, a slice of gorgeous cake …… and my anti-sickness pills!! So, there you are. It was a good day, in the end. And that’s how it all linked up. Food, Furniture …… and First Chemo Sesh!